The photo above is of my daughter. I set up a pretend restaurant for lunch on the back porch. She wore a straw cowboy hat with red trim and one of my old dresses pulled up over her tshirt. 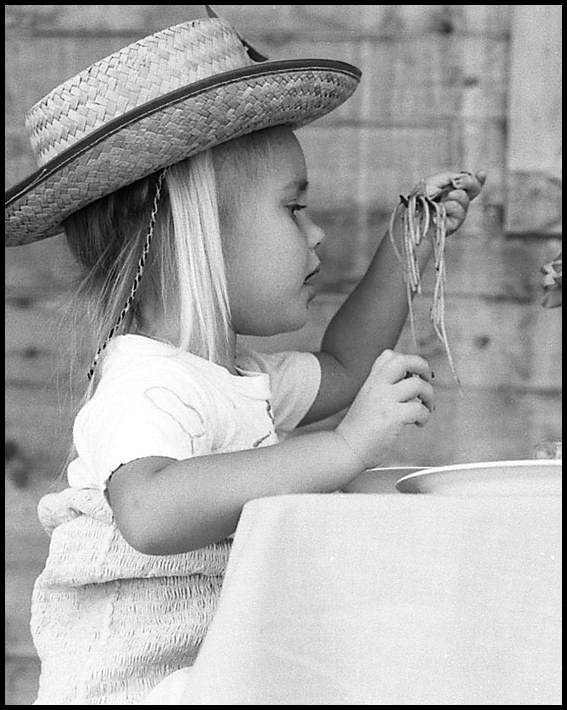 I see the chipped nail polish on those pudgy little hands and the concentration on her face as she eats her (still) favorite food - pasta, my heart sings. That was about 20 years ago. Where does the time go my friends? The Fortune-Telling Birthday Book might be just for fun but they sure got my daughter pegged. She is turning 25. It happens Sunday. I won't physically be there with her but my heart will be, it always is. Have a great weekend - see you on Monday when I announce the winner of the necklace giveaway. If you haven't entered there is still time, click here. Dear Jeanette, what a wonderful mother you are. The deep love you have for your daughter shines through in every post that you write about her and although you won't be together for her birthday I know you will make it very special anyway. Thank you for introducing me to the Fortune-Telling Birthday book. I've just followed your link and read through the first couple of pages. My birthday quote was spot on - March 16. So sweet. I hope she has a wonderful Birthday. such a sweet tribute-my youngest turns 8 on Monday-so happy birthday to the girls! Happy birthday to your beautiful daughter. Where does it go?? Oh Jeanette - what an adorable photo!! It is my daughter's birthday today! She is 18!! I just can't believe it - seems like yesterday she was the age of your daughter here. Wishing your a wonderful day as well!! Happy Birthday MJM! 25! Woo Hoo!! Precious picture! Makes me wish my boys had grown up playing restaurant with you! Oh the fun your mom and I would have had! Pasta on the ceiling - ahhh, good times! And yes, J, I echo Felicity - your love for her shines through. Happy birthday to your lovely daughter. And why wouldn't she be? She has a great mom! happy bday to your daughter - that is one adorable picture! She's lucky to have such a wonderful mother. Happy early birthday to her! Yes, the birthday book is right on! She is a credit to you and A.H! Jeanette you are an amazing woman and a fabulous mother... If I turn out to be half the mom you are then I will be happy. What a great photo. Funny how favorite foods can stick with someone forever. Happy early birthday to 'the kid'! We will miss you on your b-day but are looking forward to seeing you next month! awwwwwwwwww, so sweet, they grow up too fast. What a lovely memory ! Happy Birthday to you both Mum and Daughter. Oh such a cute photo! I don't get that pleasure of such fun things with my step-daughter... maybe someday I'll have a daughter too... to spoil like that! Happy birthday to her! They age, we don't, right?! Happy birthday to your daughter! Did my comment go bye-bye. I’ll try again. Happy Birthday lucky daughter of Jeanette. This has me teary eyed! What a lovely post to your daughter. She is so lucky to have such a wonderful mom like you!! A beauty, your little cowgirl.. I remember this little girl. I had the pleasure of her company on more than one occasion to spend time with her at this age. She was such a sweet little soul. So polite, respectful and well beyond her years. I loved spending time with the two of you back then. Now I have a little girl just about this age and she is one of the most beautiful blessings in my life. Dear Jeanette, I just read your Valentine's piece at 'Women's Voices for Change'...It is a very lovely read....thank you, xv. A beautiful photo. Happy Birthday wishes to your daughter. You must be very proud of her, and she, you. if this isn't the cutest picture ever i don't know what is! !